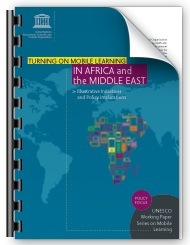 The ninth and tenth papers in the UNESCO Series (introduced on EduTechDebate here) examine mobile learning in Africa and the Middle East. The number of mobile phone users in Africa and the Middle East has exploded in the past decade and a half. Africa, the continent facing the most urgent educational challenges, is expected to have over 735 million active mobile phone subscriptions by the end of 2012. In 1995 there were only 600,000 subscriptions. For the first time in history, a majority of Africans have individual access to interactive information and communication technology. In the Middle East an even higher percentage of people own and use mobile technologies. And since the 2011 Arab Spring no one questions their potential to connect and empower average citizens. According to the UNESCO published paper, Africa and the Middle East are “leapfrogging” the earlier PC revolution and enthusiastically embracing the more recent mobile revolution. Unlike countries in Latin America for example, African countries (and many in the Middle East as well) have not made substantial investments in filling schools with computers or providing laptops to students. At some level, Africa is (for lack of a better phrase) a “clean slate” when it comes to ICT use in education. Because so many Africans have mobile phones, many educators are eager to leverage these devices to improve and provide greater access to education. One model of accomplishing this is called Bring Your Own Device (BYOD). The name is sufficiently descriptive: according to this model students simply use the mobile phones they already own for educative purposes, and sometimes for purposes recommended or required by schools and teachers. The approach has gained traction in many developed countries (most notably in the United States) due to its affordability and flexibility. Other models require schools to purchase mobile devices for students which dramatically increases costs. The obvious disadvantage of BYOD programs is that not every learner has the same device or even a device at all. Also, managing different types and models of devices on a school network can be difficult, and incorporating mobile learning into curricular activities is much easier when the same devices are being used by all learners. Yet in Africa and the Middle East cost is paramount, as illustrated in the paper. Schools often have difficulty providing basic infrastructure for students let alone personal technology. Could BYOD work in Africa and Middle East? How would it look compared to, say, BYOD models being employed in North America? How might countries maximize the cost and convenience benefits of this model while still ensuring equity? Is BYOD the future of access to mobile learning in developing countries? The second paper Mobile Learning for Teachers in Africa and the Middle East: Exploring the Potential of Mobile Technologies to Support Teachers and Improve Practice looks closely at how a handful of programs have employed mobile devices to support teachers and enhance their professional development. This paper describes several projects that use mobile technologies to support teaching and learning as well as educational administration. The paper argues that basic mobile phones (often referred to as “feature” phones) are not especially conducive for tasks beyond rudimentary communication. While a number of projects have assisted teachers and students by pushing educational materials to their phones via SMS, projects that attempt richer collaboration and greater interaction tend to rely on smartphones. While most experts agree that smartphones will eventually become commonplace in Africa (and have already made serious inroads in the Middle East), today a majority of people in developing countries own basic mobile devices: the screens are small; resolution is mediocre; navigation can be cumbersome; and text and images often display only in black and white. 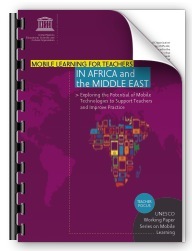 Therefore, in Africa as well as many places in the Middle East the immediate question is: How can basic mobile phones be used to improve teaching and learning? The paper describes a number of innovative approaches, several of which have gained traction and benefit large numbers of students (for example, Momath and Yoza both in South Africa). Yet despite these promising projects, there are not a huge number of models to choose from when it comes to improving or extending education with basic phones. Although projects like SEMA! in Kenya aimed to impact teaching and learning and foster greater collaboration among educators, it has been most influential as a means of streamlining data collection about enrolment rates. According to the paper, the project, despite lofty ambitions, seemed to revert to a sort of digital notice board and quantitative questionnaire. This does not, of course, mean the project was a failure (if there is one area in which mobile technologies have proven themselves in education, it is as an cost and time efficient means of collecting administrative data). Instead the SEMA! project signals the difficulty of developing mobile learning programs that rely on basic phones, as opposed to smartphones. What are some of the ways basic mobile phones might be used to assist teachers and improve their practice? How can educators in Africa and the Middle East leverage the phones that are already in their pockets (and often in the pockets of their students) to enhance learning? Or, alternatively, has the educational potential of basic mobile phones been overstated? Written by Mark West on May 16, 2012 in Mobile Learning Initiatives. I think the BYOD may be a solution. Indeed, in Africa in general learners and trainers are often better equipped than educational institutions. The BYOD will then solve the lack of computer equipment. Institutions by providing a WiFi connection allow learners and instructors to access the Internet. Thanks Antoine. BYOD is definitely worth exploring in Africa. Thank you for this article. In Bangladesh, we are attempting to leapfrog illiteracy by delivering illiteracy proof audio/video information and learning tools directly to households through Android tablets. Please check us out at http://amadeyr.org/en/content/digits-all-dta and check out videos of our participants at http://www.youtube.com/user/amadeyrcloud?feature=…. This looks like a very interesting project. Sustainability is always a challenge but your site explains your approach to it. Good luck with the project. I came across this site "by accident" and I must say I´m impressed. By the attitude, of both government, teachers and students in what is presented on this site. What I mean by this? I am still a K12 teacher and also editor of http://www.ict21st.com (the Norwegian main site http://www.iktforlaget.no) and I am a member of various fora on the www. My impression is that we in both the USA and in Europa think more about the technical issues AND the curriculum. Both teachers and management seem to be afraid of not reaching the expectations of teaching in the 21st century. And what are the expectations? It seems that Finland is the only country where they have made this change of praradigme, in the 1970s, crawling out from the grip of the old Soviet. 5 years teacher training, well paid, and hight status. And the understanding that we have to teach "for the unknown". To create environment for innovation in all aspects of life. What I want to ask is: are the African teachers more openminded / not so restricted by curriculum, tradition and expectations since they obviously get results and solve ICT challenges with less money, tools and education? African teachers – and their is no way to be fair to everyone in this statement – are under trained, afraid of technology, have too many students, that cannot meet the needs of all their students and often teach to the test or the top of the class. They don't know how to break the cycle of their daily responsibilities. They might believe that what they are doing needs to change, but don't know how to break out and change. They will need support for making changes.